Surrender at 20: Red Post Collection: Champion Poros, New ALL CHAT, Bard's E Portal, DJ Sona's music layers, and more! Red Post Collection: Champion Poros, New ALL CHAT, Bard's E Portal, DJ Sona's music layers, and more! 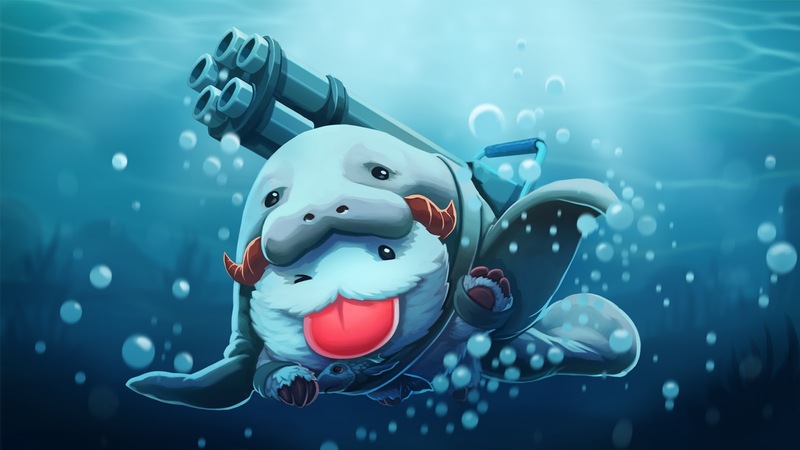 This morning's red post collection includes another look at the champion poros first seen in February's LAS/LAN/BR event, a new episode of /ALL Chat, KateyKhaos on the recent DJ Sona change that resets her music layers on death, ZenonTheStoic with a few comments on Bard's E portal, and more! In case you missed their debut appearance in the recent LAN / LAS / BR event, Riot Jynx has reposted all of the adorable champion poros! "Carnival may have come and gone, but the poros aren't done celebrating! Check out the preview below with them dressed as your favorite champions before visiting the full gallery on Imgur." Dash and the crew are also back with another episode of /ALL CHAT, including a look at a real life Jinx gun & a #D printed Cho'Gath, an interview with CLG's MaTTcom, and more! "CLG’s general manager MaTTcom stops by, 3-D printed Cho’Gath, and a Jinx Zap! pistol that shoots real lasers on this week’s /ALL Chat! Check out the video's description of source links for everything mentioned in the episode! I've noticed an 'addition' to DJ Sona that was introduced recently. Since patch 5.5 DJ Sona loses her bonus music layers (the ones that she gains upon using Q, W and E for the 1st time) whenever she dies and can regain them by using Q, W or E again. Is this an intended feature or a bug? I wanted to step in and clarify this, since it's been something several players have brought up! This is intended behavior and not a bug. We felt that only hearing the layers stacking once per game was a lot less exciting than being able to build up the layers of music multiple times per game. This was added the patch after her release (patch 5.5). This changed was also mentioned near the end of Riot's LoL Music panel at PAX East 2015! "I have to say, this is a pretty click-bait title :P I'm happy to answer questions about the article while watching March Madness. To start, it's important to understand that in the context of the article, we have very specific definitions of what it means to be negative, neutral, or positive. Negative: these are players that are consistently verbally abusive, or consistently have signs of racism, sexism or homophobia in their language. In League today, less than 1% of players fit this bucket. On average, these players could show negative behaviors in as high as 25% of their games. Neutral: these are players that are generally passive in chat. They don't talk too much beyond talking about team strategy, picks/bans, jungle timers, and usually end the game with "gg" or "ggwp." In League today, about 89% of players fit into this bucket and I don't think that surprises anyone. In fact, most players would love to have these types of players as teammates. As far as players are concerned, you might consider these "positive" teammates because they are fun players to have as teammates; but, it's important to note that this article is specifically about the quantifiable definitions we use to do our research. Positive: these are players that are active positive influencers. This means they are often chatty in games, and actively make the environment a more positive place. These players go out of their way in a large number of their games to be upbeat, and bring teams together. Right now, about 10% of players fit into this bucket, which I don't think surprises anyone either. When you look across these player types, you see that the 1% negative players are the "source" of about 5% of the toxicity in an online ecosystem. So, they do cause a non-trivial amount of toxicity; in fact, when you compare the # of negative players to the % of toxicity caused it's a 5x multiplier. The 99% neutral or positive players don't have perfect behaviors, and we see that they have bad days or streaks once in awhile. It might be a bad day at work, a bad day at school, and they carry that into a game and are negative a few games in every 100 games. So, when you compare the # of neutral or positive players to the % of toxicity caused it's about a 0.96 multiplier. Looking at this data, you should see that we need different solutions to improve player behavior in League. One, we'll always need punishments like chat restrictions, ranked restrictions and more to reform or remove the 1% negative players--they don't respond very much to rewards (positive reinforcement) or other mechanisms. However, two, we need to do more positive reinforcement because that's the best way to nudge neutral players to be more positive. I think we've made a lot of progress as a community in the past few years but we can certainly do more. A very simple test is to reflect on your last games and think, "Did I see any signs of racism, homophobia, or sexism?" Most players these days can't even remember the last time they saw or heard these things in League, and I think that's awesome. Anyways, back to March Madness, and happy to answer any Qs." "We want to, but it's always a question of spending time working on more stuff for players, or spending time writing a paper for the academic community. We've decided to compromise. We're going to collaborate with academic institutions on some of these research studies so they can write up the papers. For example, we're going to be presenting some work with MIT on Collective Intelligence this year (why some teams perform better than others). We think this type of research would be immensely valuable for many fields of study such as social psychology, anthropology, behavioral economics and more. We're hoping more academic institutions collaborate with us so we can make a better game, and they can write the papers to push their fields forward." "We do see some trends where negative players cause other players to become more negative, and positive players cause other players to be a bit more positive. However, a lot more research has to be done in the space to understand the "influence" of players on others." Are there any statistical differences in toxicity levels between the different queues, and for pre level 30 versus level 30 play? Yes, not surprisingly, Ranked is the most negative queue. However, given the higher stakes and higher intensity, it's kind of expected. For levels, it varies depending on what you are looking at." "One insight I can reveal here is that, maybe not surprisingly, Support are among our most positive players and don't receive the most reports or negative behaviors from others." "There's a lot of modifiers to reports to determine their value, but the most important one is "report history" or track record. So, historically, if you report players that are accurately flagged by LeaverBuster, Machine Learning, Tribunal, etc, your reports get stronger. If you report players that are neutral or positive, or use reports as threats, you generally lose all report value. We do some other slight modifications but the above is the critical one." " So far, we haven't seen any meaningful change to toxicity in Normal Draft as a result of Ranked Restrictions. I think a lot of the perception is confirmation bias from a few select players. Realistically, something like 0.1% of players are getting ranked restricted and put into Normal Draft mode, so most players aren't even in games with ranked restricted players. But, when players notice something negative in Normal Draft now, it's easy to make the wrong conclusion that it's because of Ranked Restrictions." "We're working on more continuous surprises throughout a year instead of just once a year." "To be honest, we haven't decided yet." "Right now, approximately 20% of players on most servers have an Honor Ribbon. But, the problem is that most of those players mainly play Howling Abyss or Co-op vs Bots so the system is not visible in Ranked or Normals as much. Secondly, we don't have clear feedback loops around why giving Honor is valuable, and what makes receiving Honor valuable. We have a couple ideas about how to fix these issues in the future, but it's too early to talk about them because we're heads down in Team Builder." There are a couple reasons we have been hesitant to do this. Global SFX have their place. We try only to use global SFX when absolutely necessary, and even Sion was pushing the envelope. Global VO is an almost totally different issue, as its not just English that we have to take into consideration. There are languages that are much longer than English, and while it might be fine for english... it might not be for others. Seb also posted on this awhile back - posted in the comments of this thread as well. His reply was: "We also saw some requests for global VO on Requiem; the main issue there is that Karthus’ R lines are pretty dang long so as to match the channel time, and long global VO could turn annoying very quickly when you’re hearing it (not to mention dying to it) every couple minutes. We definitely liked the idea though, so we added a global, evil laugh to Requiem that’ll crank up the feeling of impending doom no matter where your enemies are on the map." Outside of the potential "annoying" element, We have been very wary to set global dialog phrases (outside of the Nocturne one-word Ult line and Kalistas bind - and a lot of people think Kalista's global dialog is a bug). Let me do some testing with the different languages. I cant make any promises though! Thanks for the feedback - keep it coming!" "I know Rabid Llama is working on this. You can click on the portal or you can click on the exit to go through, but depending on camera angle it can be hard to do successfully." I don't know how interested you guys are on preserving the aesthetic, but you could just put a magical-looking symbol on the ground where clicking will send you through the portal. That would stop the issues with camera angle. We actually tried a "clicker" (think Azir passive), but the problem with that is that our clickers are 3D objects that live in the world and so they also suffer from various camera angle issues. I don't know the details of Rabid Llama's current implementation, but he's a super a smart dude. I fully trust that he'll figure out a reliable way to make the journey magical. I seem to remember that his main problem was with baity journeys, where you make the tunnel but don't take it and bait enemies into clicking it by accident. This is a very precarious balance to strike." "My personal take is that 5.5 seems to have been very positive for the game, at least so far. Haven't had a chance to make it through all the recent competitive games yet, heartening to see some champs played that haven't been seen there in quite a while though. Hope at least some of that increase in diversity's maintained. I wouldn't say 5.5 was 'mission accomplished' though, just a piece of the puzzle. One of the next things we're looking at is some further work on the jungle items (Skirmisher's and Poacher's aren't used much at the moment and there good reasons for that - they're generally pretty overshadowed)."